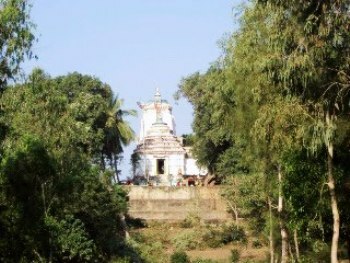 The temple of Bali-Harachandi is one of the important Sakta shrines of Odisha. It is situated on the sea-shore in Brahmagiri area of the Puri district. This shrine is exactly located 6 km to the left side of the Kathuabada Chhak of the main road, which lies between Puri and Brahmagiri and also 27 km to the south-west of Puri town. Due to its picturesque location amidst thick growth of Casuarina trees, devotees usually visit the shrine of Bali-Harachandi. The temple gives a majestic appearance in view of its location on a huge sand dune overlooking the blue water of the Bay of Benga1. The Goddess Bali Harachandi is considered by people as one of the Asta-saktis of Odisha. Hence the site of the temple is an important Sakta pitha of the Puri District. The shrine is also one of the notable Tantric pithas of ancient Odisha. According to tradition, the present temple was built on the ruins of an earlier dilapidated temple. The temple of BaliHarachandi is erected over a sandy ridge of 25 feet high from the road level. A modest attempt has been made in this article to highlight the art and architecture of this temple.The temple of Bali-Harachandi consists of two structures such as vimana and jagamohana. Both the structures of the temple are heavily plastered with lime mortar. It is built in sand stones, which is locally known as Baulamala and Kanda patharas. This temple faces to east.